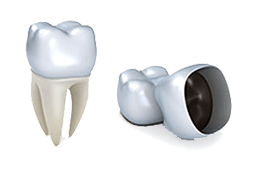 When a tooth is cracked, decayed, or damaged, a crown may need to be fitted onto the tooth. A crown is a permanent covering that fits over the original tooth. Crowns can be made of porcelain, gold and other metals. Porcelain crowns typically have the most realistic appearance. Crowns can whiten, reshape, and realign existing teeth, adding to a healthy and vibrant smile. A bridge is a device used to replace the space where a tooth has been removed. A typical bridge consists of a pontic (filler tooth) that is attached to two surrounding crowns (abutments). Once complete, this bridge structure is bonded into the mouth. Without the use of a bridge, gaps in the mouth where natural teeth are missing can cause multiple teeth to shift, lead to occlusion (biting) and/or jaw problems, and spur periodontal disease. Bridges safeguard the integrity of existing teeth and help maintain a healthy, vibrant smile. Crowns/Bridges usually require two trips to the dentist's office. During the initial visit, the surrounding teeth are numbed with a local anesthetic. The dentist prepares the surrounding teeth by cleaning any plaque or decay that remains and reducing them so that the crowns can be fitted. The dentist makes a mold of the teeth and sends it off to a dental lab where the customized impression is prepared. The customized mold takes one to two weeks to return to the office. 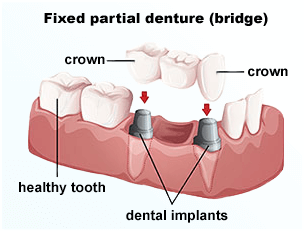 In the interim, patients are fitted with a treatment crown/bridge constructed of acrylic resin. When the patient returns to the dental office, the dentist removes the treatment crown/ bridge and replaces it with the permanent one. The dentist then adjusts the crown/bridge for the proper bite and fit, and the crown/ bridge is permanently bonded into the mouth. Because the poetic and crowns are constructed as a single piece, special care must be given to ensure that the gum line and area surrounding the new structure are kept clean. Special floss is often necessary to clean underneath the teeth and maintain strong, healthy gums. With proper dental care, crowns/bridges can service the patient for many years. Interested in finding out more about crowns/bridges at our office, contact us today!